Park Tables provides city and state parks with quality park barbecue grills. Park BBQ Grills are a center piece of our products and you will find them in virtually all public picnic areas. Whether it is used for a picnic area at an apartment or a group pavilion at a national park, we have the perfect grill for your needs. For over 50 years these park grills have served the public in various settings throughout the United States. Park Tables offers Group Size Barbecue Grills for use in shelter houses, pedestal grills which make great use as public park grills. Wheelchair Accessible Park Grill, ADA Approved, 3/16" Steel Body 300 Sq. in. Cooking Area, Swivel Grate, 80 Lbs. Pedestal Park Barbecue Grills burn charcoal and wood for the best outdoor grilling. Our BBQ pedestal grills are manufactured with heavy duty steel fireboxes, adjustable grills and attached galvanized pedestal posts for in-ground mounting. Covered Park BBQ grills keep the fire box covered for safety and smoked cooking. Park Tables practical covered grills can use charcoal or wood for a great cookout. Our Wheelchair accessible fire rings meet all ADA requirements! Fire Rings for campgrounds at local parks, city parks, and national parks are used in national campgrounds and parks for fire safety. Group Park Barbecue Grills serve large group barbecues. Group barbecue grills are for gatherings to serve up large quantities of barbecue burgers. 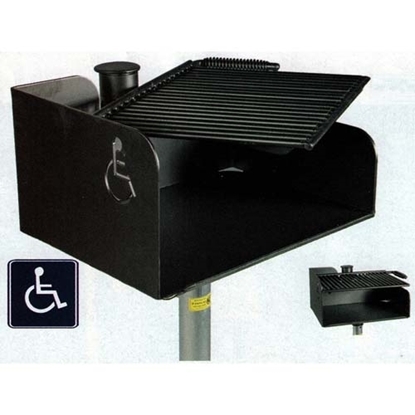 Park Barbecue Grill Accessories give extra grill accessories customized for park grills to add functional convenience. We also offer Quick Ship Park BBQ Grills that ship out in 2 Business Days!